January Sale – Save 25% On All TrustedHousesitters Membership Plans! 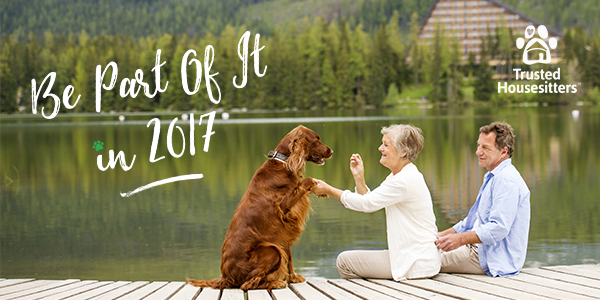 Be Part Of It in 2017 . . .
2017 is fast approaching, making now the perfect time to start planning next year's travel adventures. Whether you’re looking for real pet care from real pet lovers or have the time to travel and looking for the opportunity to care for pets in exchange for a place to stay, then TrustedHousesitters offers the perfect solution. Change your life and the lives of pets this year by being a part of the pet care revolution! Offer: 25% off all TrustedHousesitters membership plans, making joining the TrustedHousesitters community exceptional value. T&C’s: We please ask that any promotional messaging for this campaign runs for the promotional period only while the code is live and discount is available on trustedhousesitters.com. Commissions will only be paid out for transactions during this time. - We connect home and pet owners who need a sitter, when going away, with trustworthy people who are happy to sit for FREE. - We are leading the Pet Care Revolution! - TrustedHousesitters is the world’s #1 house and pet sitting service. Over 300,000 people in over 140 countries use our service because it is convenient and offers the best and most stress-free care for pets. - We have facilitated over 1,000,000 nights of house and pet sitting globally, saving members more than £150 million in accommodation and pet care costs. Please get in touch claire@trustedhousesitters.com if you have any bespoke requirements or promotional opportunities you'd like to discuss!